Unless you’ve lived in a hole or have the world’s most effective crystal ball, the past year has probably made your head spin with the amount of disruptive shifts in attitudes and behaviors. Chief among those that should concern marketers is a new national conversation about the media. Do Americans trust the media? Do your customers? And most importantly, as you set your media budget, how much do they trust different media as advertising channels? Read on to see recent data from 1,200 U.S. consumers about which ads customers trust when making a purchase decision. 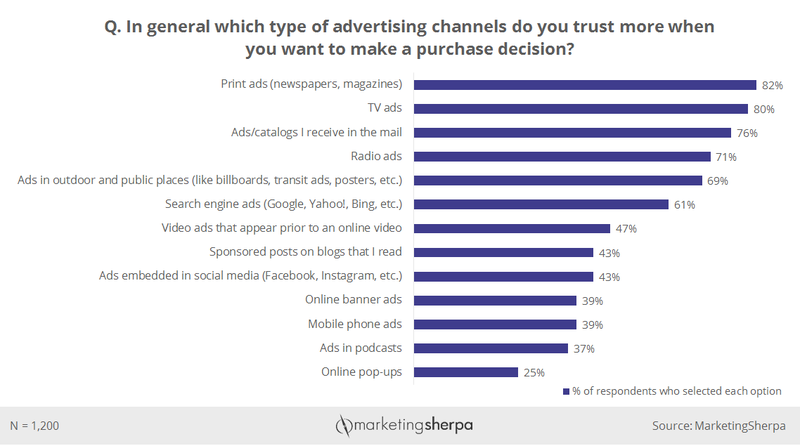 In October 2016, we asked 1,200 consumers: “In general which type of advertising channels do you trust more when you want to make a purchase decision? Please sort the options into ‘Ads I trust’ and ‘Ads I don't trust that much’ categories.” Below you can see the results for the “Ads I trust” category. With the digital marketing industry abuzz about ad blocking, it’s not surprising that online pop-ups were significantly less trusted than other advertising channels we asked about — only a quarter of Americans (25%) indicating they trusted these ads when making a purchase decision. However, if you believe the latest chatter about newspapers and magazines, you might be pretty shocked by the most trusted advertising channel — prints ads. The conventional wisdom after the 2016 election would have us believe that the majority of Americans no longer trust the mainstream media in general and newspapers in particular. But the overwhelming consensus of the 1,200 U.S. consumers we surveyed paints a different picture, at least for advertisers and marketers. While we have no data about their trust of newspaper journalism, consumers do trust newspapers and magazines more than any other advertising channel at the point in time that matters most to marketers — when they are making a purchase decision. Prints ads were the top advertising channel according to our survey, with four out of five Americans (82%) telling us they trusted newspapers and magazine ads. In fact, there was a clear schism between traditional/offline advertising and digital/online ads. The five most trusted channels were all traditional channels while the bottom eight channels were all digital. Search engine ads led the pack for digital advertising, garnering the trust of 61% of consumers, and online pop-ups fared the worst. Why are print ads the most trusted? There are likely many reasons for these results, and feel free to share your own analysis while sharing this article on Twitter or LinkedIn. In my opinion, print’s scarcity and standards make it more credible. While that online pop-up is annoying in and of itself, when it’s popping up over low-value online content, it becomes even less trusted. While the vaunted New York Times features “All the News That’s Fit to Print,” digital content pretty much just stops at “All.” There’s very high value online content (like MarketingSherpa, natch), and even most print publishers publish online as well, but that real value is drowning in a sea of mediocrity (or worse), and as a whole, it damages customers’ trust. “Many marketers are different from their customers, and probably assume that customers see and trust digital ads, but that is not the case. Marketers need to get out of their digital bubbles to understand what people are really reading and viewing,” Gudema said. This isn’t to say that you should only buy print ads or avoid online pop-ups entirely. Each channel can have its place. Just know that advertising in newspapers and magazines will tend to add credibility to your product or service, while an online pop-up add will reduce the credibility for your product or service. Just the ad placement itself. But there are many other factors — from the message to the execution to the product to the offer — that will affect consumer trust. So if you do choose to use online pop-ups or another less trusted channel, keep those factors in mind. If you have a pop-up on a credible site that is delayed enough for visitors to absorb what’s on the website that includes a relevant or timely offer in a non-garish (FLASHING NEON!) way, you may still find success with the tactic. Consider how customers perceive the channel itself, and then look at what else you should do to enhance credibility and trust. This chart is from the MarketingSherpa Customer Satisfaction Research Study which explores the factors that influence customer satisfaction. Looking for something to enhance your marketing career? Explore how you can work with MECLABS Institute and the University of Florida to earn an accredited graduate degree. Learn More.